Brand new, rarely used, This light weight easy to tow caravan can sleep 4 1x double 1x single and tabe converts to another bed. 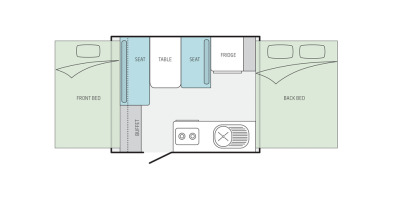 For your convenience, there is cutlery, and place setting for 4.. refrigerator runs on gas, 12 volt, or mains. Caravan extension lead provided. Water holding tank for washing up. There is a cook top. ***Optional extras-these items are a courtesy, there is no charge for them. Gazebo with side panels for shade or larger eating area.. Anything you might need, just ask, we'll accommodate if available. Pop up sun shade for at the beach. This is a new caravan, please treat this as such. *** small dogs are welcomed, this is not suitable for large dogs. Any damage from pets is the responsibility of the leasee. No Smoking - fees apply if determined it's been smoked in. Prefer you to cook outside with a BBQ. Please keep it tidy. Cleaning fee does apply. This is not for off road. There are Optional extras available, if you need something, ask, we may have it. Complimentary. Roadside assistance included with CIL. First time I have booked a caravan before and what an experience! First off I would like to thank Elizabeth for making this experience very enjoyable for us! She was very happy and friendly with us and was very easy to deal with. The caravan is almost brand new, in excellent condition and is very cozy and comfortable to stay in. We loved it and definitely will book again with Elizabeth! 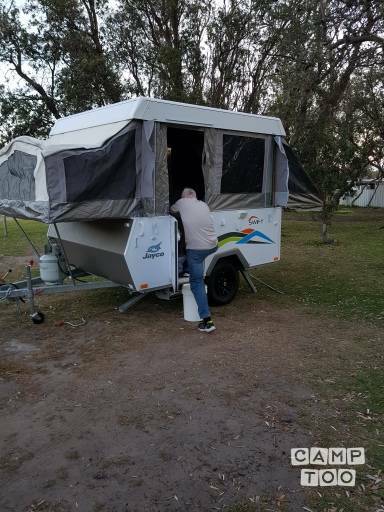 The Jayco Swift camper was awesome for the three of us. Easy to tow and the perfect size. Easy to set up and very clean and functional inside. Elizabeth and the staff at Camptoo answered all my queries promptly and professionally. You can pick up the caravan in Frankston at Elizabeth's place.